"One of the most ancient Clos de Champagne, only on 5.5 hectares". 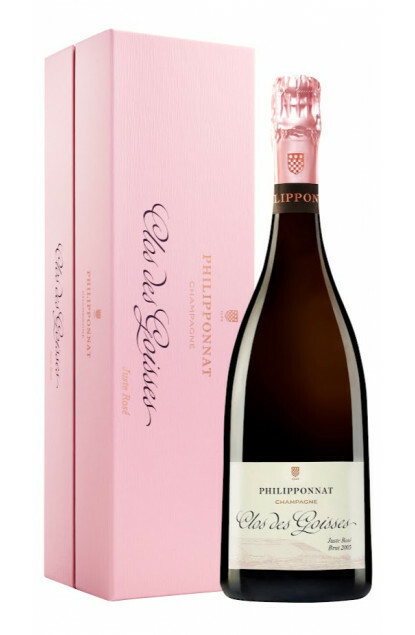 It is a wine of Rosé Champagne coming exclusively from the Clos des Goisses (which is where its name comes from, meaning “sloped clos”), one of the most ancient Clos of the Champagne region, whose surface area is 5.5 hectares, located in a Premier Cru area in the town of Mareuil sur Aÿ. Property of the Philipponnat House for almost a year, it is fully south-facing, an optimal exposure, unique and outstanding with a slope of 45%. It also is a Champagne wine composed of 65% Pinot Noir and 35% Chardonnay. Vinification takes place in wooden casks for half of the wines and the wines are aged in bottles and in cellars for at least 8 years. The colour is a delicate pink, pale and bright. To the nose, the first impression is on notes of red fruits (raspberry and strawberry), followed by aromas of pink grapefruit candied peels. To the palate : great minerality and a beautiful balance between vinosity and acidity followed by touches of redberries. To be served cool, around 12°C but for great amateurs, in a wine carafe like all Burgundy or Bordeaux great wines, with fishes and pink meats (veal or lamb). A Champagne with a high potential of ageing on at least 10 years, in your cool cellar, away from light and laid flat.